In the Bull of Indiction of the Great Jubilee of the Year 2000 Incarnationis Mysterium (=IM), His Holiness Pope John Paul II speaks of certain signs which have enriched the celebration of the Jubilee throughout history. He mentions in particular the sign of the Holy Door (IM 8). The Holy Father had already emphasized in Tertio Millennio Adveniente (=TMA), the special importance of the Holy Door in the Jubilee of 2000: "The Holy Door of the Jubilee of the Year 2000 should be symbolically wider than those of previous Jubilees, because humanity, upon reaching this goal, will leave behind not just a century but a millennium" (TMA 33). The rite of the consignment and the reading of the Bull of Indiction of the Great Jubilee took place on the First Sunday of Advent 1998 in the atrium of the Vatican Basilica, in front of the Holy Door itself. The Door, although closed, was appropriately decorated for the occasion, as if to indicate to all the attitude of contemplation and positive hope with which the Church has long been preparing to cross the threshold of the Jubilee of the Year 2000. The importance of the sign of the Door during the Jubilee of 2000 will also find ritual expression: for the first time in the history of the Holy Years, the Pope will personally open all four Doors of the Roman Basilicas. According to the description given in 1450 by Giovanni Ruccellai of Viterbo, it was Pope Martin V who in 1423, at the Basilica of Saint John Lateran, opened the Holy Door for the first time in the history of the Jubilee. In those days, Holy Years were celebrated every 33 years. In the Vatican Basilica the opening of the Holy Door is first mentioned at Christmas 1499. On that occasion Pope Alexander VI desired the Holy Door to be opened not only at Saint John Lateran but in the other Roman Basilicas as well: Saint Peter’s, Saint Mary Major and Saint Paul’s Outside the Walls. A small door, probably a service door in the left part of the facade of Saint Peter’s Basilica, was then enlarged and turned into a Holy Door, in the same location where it is found today. This involved the destruction of a chapel decorated with mosaics located inside the Basilica and which had been dedicated by Pope John VII to the Mother of God. The Pope also desired the norms of the Ceremoniale of the Holy Year, left vague by his predecessors, to be more clearly defined, particularly the rite of the opening and closing of the Holy Door. The drawing up of the rites was entrusted by the Pope to the famous John Burckard, Master of Papal Ceremonies, a native of Strasbourg and Bishop of the combined Dioceses of Civita Castellana and Orte. The Holy Door of the Jubilee of 1500 was opened on Christmas Eve 1499 and was closed on the Solemnity of Epiphany in 1501. The Ritual prepared by Burckard and approved by the Pope, apart from a few slight changes introduced in 1525 by the Master of Ceremonies Biagio da Cesena, has been substantially followed in all subsequent Jubilees. - The Pope vests in a room of the Apostolic Palace and then, together with the Cardinals, proceeds to the Sistine Chapel. There the sending of the Cardinal Legates for the opening of the other Doors and the adoration of the Blessed Sacrament takes place. - The procession makes its way to the Holy Door accompanied by the chanting of the Iubilate Deo or the Veni Creator Spiritus. - The Pope says the prayer Deus qui per Moysem. - He then takes the hammer, recites the verses Aperite mihi portas iustitiae and strikes the wall covering the Holy Door three times. - The Pope returns to his seat and says the prayer Actiones nostras. - The masons continue the work of opening the Door to the chanting of the Psalm Iubilate Deo omnis terra. - The Pope genuflects at the threshold of the door. - The Pope is the first to pass through the Holy Door as the choir chants the Te Deum laudamus. - The procession moves towards the altar for the celebration of Vespers. - The Pope processes into the Basilica through the Holy Door and presides at Vespers in the Basilica. - He then sends the Cardinal Legates charged with closing the Doors of the other Basilicas. - A procession follows, first to the relics and then to the Holy Door, accompanied by the singing of appropriate hymns. - The relics of the Veronica and the Lance are publicly shown and venerated. - The Pope is the last to leave by the Holy Door. - He then blesses the stones and the bricks. - With the trowel he applies cement to the threshold of the Holy Door and sets in place three bricks and a few gold and silver coins. - Other bricks are added and then the masons, outside and inside the Basilica, finish the work of closing the Door while the choir chants the hymn Caelestis Urbs Ierusalem. - The Pope says the prayer Deus qui in omni loco and ascends to the Loggia of the Basilica where he solemnly imparts the Apostolic Blessing. From 1500 to 1975 the Holy Door of the four Roman Basilicas was closed on the outside by a wall, not by a door. Consequently, at the moment of the opening, rather than a door being opened, a wall was taken down: the Pope took down a part of the wall and masons then completed the work demolishing it. There are still vivid memories of the sense of anxiety felt when cement fragments fell just a few inches from Pope Paul VI during the opening of the Holy Door on Christmas Eve 1974. At Christmas 1499 the Pope used a hammer to strike three times the wall covering the Holy Door. Initially the hammer of the masons was used and the strikes were not entirely symbolic. Almost immediately however the hammer become a precious work of art. In 1525 it was made of gold and in 1575 it was of gilded silver with an ivory handle. The trowel was used by the Pope for the rite of closing the Door. The first evidence of its use dates from Christmas 1525. The last Pope to use the trowel was Pius XII, during the closing rite of the 1950 Holy Year (cf. L’Osservatore Romano, 26-27 December 1950). The use of bricks in the rite of the closing of the Holy Door is first mentioned in the Jubilee of 1500. The chronicler of the Jubilee of 1423 writes that "people show such devotion to the bricks and cement fragments that as soon as the door is uncovered they are carried away by a general frenzy; the northerners take them home as holy relics" (L. Bargellini, L’Anno santo, 66). The rite of the closing the Door composed by Burckard for Epiphany 1501 calls for two Cardinals to set two small bricks, one of gold and the other of silver, into the wall. The custom of placing some coins into the wall of the Holy Door is also recorded from the time of the Jubilee of 1500. Initially the coins were simply set into the cement. From 1575 on they were placed in a small metal box. This custom is still observed. The use of holy water was already mentioned in the 1525 Ritual for blessing the rubble and bricks used in the closing of the Holy Door. Later, holy water was also used for the opening of the Door: the Pententiaries of the Basilica, once the wall was removed, cleaned both the door-jambs and the threshold with cloths soaked in holy water. This rite was observed until the last Holy Year. Outside the Basilica the Holy Door was covered by a wall, while inside the wall was covered by a simple wooden door. The door was taken away prior to the removal of the wall and replaced immediately afterwards, since it served as a barrier at night, when visits by pilgrims were not permitted. The simple and unadorned wooden doors, still seen today on the outside of the Holy Doors of Saint John Lateran, Saint Mary Major and Saint Paul’s, were the older doors which until the Jubilee of 1975 were placed in front of the Holy Door inside the Basilica. 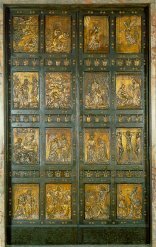 In Saint Peter’s Basilica on the other hand, the last wooden door, installed by Pope Benedict XIV in 1748, was replaced on 24 December 1949 by a bronze door blessed by Pope Pius XII immediately after the opening of the Holy Door. At Christmas 1975 modifications were made to the rite of closing of the Holy Door. The Pope no longer used the trowel and the bricks to begin the rebuilding of the wall, but simply closed the two sides of the 1950 bronze door. The door, which until that time had been inside the Basilica, thus faced outside, as we still see it today. The wall which once covered the door outside was later built inside the Basilica and on 27 February 1975 the traditional box with coins and the parchment document attesting the closing of the Holy Door was sealed inside it. The opening of the Holy Door is traditionally preceded by the rite of the "Recognitio". This involves making the necessary preparations for the Holy Door to be opened by the Pope. Specifically, the wall of bricks covering the Holy Door inside the Basilica is taken down and the box which had been sealed inside is removed. a) taking part in the rite, under the guidance of the Master of Papal Liturgical Celebrations, are the Archpriest of the Basilica, representatives of the Chapter and a Papal Master of Ceremonies. - an examination of the contents of the box and the drawing up of the official report in the Sacristy of the Basilica. Saint Paul’s Basilica: Tuesday, 21 December, at 4:00 p.m.
c) Following the "Recognitio", the Master of Papal Liturgical Celebrations will make arrangements for the contents of the boxes to be presented to the Holy Father. For the Great Jubilee of 2000 the Holy Father will open the Holy Door at all four Roman Basilicas: on Christmas Eve, the Holy Door of Saint Peter’s Basilica; on Christmas Day, that of Saint John Lateran, the Cathedral of Rome; on January 1, the Solemnity of Mary, Mother of God, that of Saint Mary Major; on 18 January, the beginning of the Week of Prayer for Christian Unity, that of Saint Paul’s Outside the Walls. Two of the Holy Doors will be opened at the beginning of a celebration of the Eucharist (Saint Peter’s and Saint Mary Major), one (Saint John Lateran) at the beginning of a solemn celebration of Vespers, and the last (Saint Paul’s) at the beginning of the celebration of an Hour of the Liturgy of the Hours. The celebration at Saint Paul’s will be ecumenical in character. In the spirit and tradition of the Jubilee, reaffirmed by the directives for the Rite of the Opening of the Great Jubilee in the Particular Churches, the opening of the Holy Door will be fittingly preceded by a "statio" and a procession. In the Basilicas of Saint Peter’s, Saint John Lateran and Saint Mary Major, the liturgy of the "statio" will take place in front of the Holy Door itself. At Saint Paul’s, the "statio" will take place in the portico in front of the Basilica and will be followed by a procession towards the Holy Door. Some texts and ritual sequences are limited to the opening of the first Door, that of Saint Peter’s, and thus will not appear in the opening of the Doors of the other Basilicas. These include: the proclamation of Lk 4:14-21, certain ritual elements and the presence of members of the assembly from various Continents (cf. TMA 21), the showing to the Church and to the world of the Gospel Book from the threshold of the Holy Door (IM 8) and the chanting of the text of the Proclamation of the Great Jubilee. Seated in the atrium of the Basilica prior to the beginning of the entrance procession will be: Bishops in choir dress, representatives of the Chapter and Penitentiaries of the Basilica, Heads of State, the Dean of the Diplomatic Corps accredited to the Holy See, and the Papal Choir. The Holy Father vests as usual in the designated Sacristy of the Basilica. The servers, a few lay persons coming from the five continents, the deacons and the Cardinal concelebrants gather in the Braccio di Costantino where, at 11:00 p.m., the procession towards the Holy Door begins. The Holy Father leaves his sacristy and joins the procession. During the entrance procession the "schola cantorum" sings Psalm 122 with its antiphon, Laetatus sum in his quae dicta sunt mihi. All take their place in the designated seats in the atrium of the Basilica, in front of the Holy Door. The Holy Father goes to the Chair and begins the celebration with the sign of the cross, a trinitarian invocation, the liturgical greeting and a monition. A prayer follows. The "schola" and the assembly sing the Alleluia and the Gospel (Lk 4:14-21) is proclaimed in Italian. The Alleluia is not repeated at the end of the Gospel proclamation. The Holy Father then approaches the Holy Door in silence. Upon reaching the Door he sings the versicle Haec porta Domini, and all respond: Iusti intrabunt in eam (Psalm 118:20). The Holy Father continues: Introibo in domum tuam, Domine, and all respond: Adorabo ad templum sanctum tuum (Psalm 5:8). The Holy Father concludes by singing: Aperite mihi portas iustitiae, to which all respond: Ingressus in eas confitebor Domino (Psalm 118:19). The Holy Father then silently ascends the steps and opens the Door by pushing its sides with both his hands. From within the Basilica two Sampietrini then open the door completely. As soon as the door is opened, the interior of the Basilica is fully illuminated. The Holy Father kneels on the threshold and remains there for a few moments in silence. Then the Choir sings the acclamation Christus heri et hodie, Finis et Principium, Christus Alpha et Omega, Ipsi gloria in saecula! After the acclamation the Holy Father returns to his Chair. Some members of the faithful from Asia and Oceania adorn the jambs of the Door with flowers and perfumes to the accompaniment of appropriate eastern music. The Holy Father then returns to the Door, ascends the steps and, at the threshold, takes the Gospel Book and silently shows it, first to the faithful in the atrium and then to those inside the Basilica. He then enters the Basilica, returns the Gospel Book to the deacon and goes to a seat placed in front of the statue of the Pietà as some members of faithful from Africa sound horns as a sign of joy. The "schola" then immediately begins the chant which acccompanies the entrance of the procession into the Basilica. The procession enters the Basilica and approaches the altar in this order: cross and candles, servers, laity, Civil Authorities, Cardinal concelebrants, the Deacon carrying the Gospel Book and surrounded by members of the laity from America and Europe holding lamps and flowers, the Holy Father. When the procession reaches the front of the altar the Gospel Book is enthroned. The deacon places the Book on a special throne. The laity place their lamps and flowers in front of the Gospel Book and the Holy Father incenses the Book. As soon as the Holy Father reaches his Chair, the chanting of the Proclamation of the Great Jubilee takes place. At the end of the Proclamation the "schola" and the assembly sing the hymn Gloria in excelsis Deo. The celebration of the Mass then follows as usual. The Gospel, as is traditional in solemn papal celebrations, is chanted in Latin and Greek. At the end of the celebration, the Holy Father returns directly to the sacristy. The rite of the opening of the Holy Door in the other Basilicas takes place as follows: the sign of the cross, a liturgical greeting and an introductory monition by the Holy Father, a prayer, the versicles chanted by the Pope before the Holy Door, the opening of the Door, a pause for prayer on the threshold, the entrance into the Basilica and the scheduled liturgical celebration. In the Basilica of Saint Paul’s, as mentioned above, the "statio" will take place in the portico in front of the Basilica. The procession will then approach the Holy Door. There the Holy Father will sing the appointed verses and then proceed to open the door. The changes introduced in the closing rite of the 1975 Holy Year have drawn attention away from the wall and towards the door. The Holy Door has thus been enriched by the profound biblical, theological, liturgical and pastoral significance attached to the door in salvation history and in the history of the Church; it thus becomes one of the most powerful signs of the Jubilee, as the Pope pointed out in TMA (33). The ritual aspect has also needed to be modified. In 1975, for example, the trowel was no longer used, since there was no longer a wall to be built; in 2000 the hammer will not be used, since there is no longer a wall to be removed but only a door to be opened. The elements of the old ritual which have become obsolete will be replaced by others which better express the biblical and liturgical significance of the Holy Door. These ritual elements are also meant to highlight some of the special aspects which, following the indications of TMA, have typified these last years of the universal Church’s preparation for the Jubilee. These will be evoked and in some way made present at the crossing of the threshold of the Holy Door of the Jubilee of the Second Millennium of the Birth of Christ. - The procession and the "statio" in front of the door, with the proclamation of the Gospel of Luke, vv. 4:14-25. Jesus’ proclamation in the synagogue of Nazareth: "the Spirit of the Lord is upon me, because he has sent me ... to proclaim a year of favour from the Lord" — a text so important in TMA (11) — clearly links the Jubilee year to the mystery of Christ made present in the time of the Church. With the coming of Christ, the time of the Church is alway a time of jubilee. The primary purpose of every Jubilee is precisely to reawaken an appreciation of this mystery in the Church. - The acclamation sung before the open Door: Christus heri et hodie, Finis et Principium; Christus Alpha et Omega, Ipsi gloria in saecula! These are the words which the Pope has proposed as a synthesis of the Jubilee. They point to the open door as a sign of Christ, Lord of history, present in his Church until the end of time (cf. Heb 13:8). - The presence of a special group of the faithful from various continents and of cultural expressions belonging to different peoples are meant to emphasize the universality of salvation and the mission of the Church as she celebrates the Jubilee in the City of Rome and throughout the world. This is also meant to recall visually the Continental Synods celebrated in preparation for the Jubilee of 2000 (cf. TMA 21). - The decoration of the Door with flowers and the use of fragrances is meant not only to honour the symbol of Christ, the universal door of salvation, but also to be a sign of the joy which is so much a part of the Jubilee Year (cf. TMA 16; IM 6). The joy expressed by the flowers and by fragrances adorning the Door replaces the penitential sign of the lustral water formerly sprinkled on the door-jambs by the Penitentiaries of the Basilica. When the Pope crosses the threshold of the Holy Door, it will be a moment of joy shared by the whole Church; the Door is decorated and made fragrant by the faithful who share in the Christ’s royal priesthood in the Church. - The showing of the Gospel Book by the Holy Father at the center of the Holy Door emphasizes once more the centrality of Christ, the Word of the living God, the Gospel of the Father. Proclaiming the Good News will continue to be the task of the new evangelization in the coming Millennium. - The sounding of horns, using native African instruments, evokes the convocation of the biblical Jubilee, but it also marks the joyful beginning of the Jubilee year for the whole Christian people, and especially the young Churches, which have never before been so involved in the celebration of a Jubilee. The sound of the horns not only expresses joy at the opening of the door but also invites all Christians to cross the threshold of hope during the Jubilee year. - A group of lay people from America and Europe will also accompany the procession with the Gospel Book towards the papal altar of the Basilica. They represent these two continents and their presence recalls the recent Synods celebrated in preparation for the year 2000. - The text of the Proclamation of the Great Jubilee has been specially prepared for the occasion. Lyrical and joyful in tone, and interwoven with biblical, liturgical and patristic references, it will be proclaimed by a deacon and punctuated by music from the choir. the beginning of our Redemption. Let us celebrate the beginning of the Great Jubilee". The words of Pope John Paul II in the Bull Incarnationis Mysterium help us to understand the importance of the Holy Door and the Great Jubilee of the Year 2000. The sign of the Holy Door, so outstanding a sign of the Jubilee of 2000, "evokes the passage from sin to grace which every Christian is called to accomplish. Jesus said: ‘I am the door’ (Jn 10:7), in order to make it clear that no one can come to the Father except through him. This designation which Jesus applies to himself testifies to the fact that he alone is the Saviour sent by the Father. There is only one way that opens wide the entrance into the life of communion with God: this is Jesus, the one and absolute way to salvation. To him alone can the words of the Psalmist be applied in full truth: ‘This is the door of the Lord where the just may enter’ (Ps 118:20). "To focus on the door is to recall the responsibility of every believer to cross its threshold. To pass through that door means to confess that Jesus Christ is Lord; it is to strengthen faith in him in order to live the new life which he has given us. It is a decision which presumes freedom to choose and also the courage to leave something behind, in the knowledge that what is gained is divine life (cf. Mt 13:44-46). It is in this spirit that the Pope will be the first to pass through the holy door on the night between 24 and 25 December 1999. Crossing its threshold, he will show to the Church and to the world the Holy Gospel, the wellspring of life and hope for the coming Third Millennium. Through the holy door, symbolically more spacious at the end of a millennium, Christ will lead us more deeply into the Church, his Body and his Bride. In this way, we see how rich in meaning are the words of the Apostle Peter when he writes that, united to Christ, we too are built, like living stones, ‘into a spiritual house, to be a holy priesthood, to offer spiritual sacrifices acceptable to God’ (1 Pet 2:5)" (IM 8). "The eyes of all were fixed on him" (Lk 4:20). These words were used of the synagogue congregation in Nazareth where Jesus read the prophecy of Isaiah. Our own eyes are now fixed on the Pope and on the Holy Door which he is about to open, so that we can joyfully celebrate the great Jubilee which commemorates the Birth of Christ twenty centuries ago. All are waiting to see the Pope who began his papacy with the cry, "Open wide the doors to Christ", personally open the Holy Door. All are waiting to see the author of Crossing the Threshold of Hope himself cross the threshold of the Great Jubilee. He will be the first to cross this threshold as a means of encouraging great crowds of the faithful to enter more profoundly into the mystery of the salvation present in the Church as she joyfully celebrates the two-thousandth anniversary of the Birth of her Spouse and Lord, Jesus Christ.